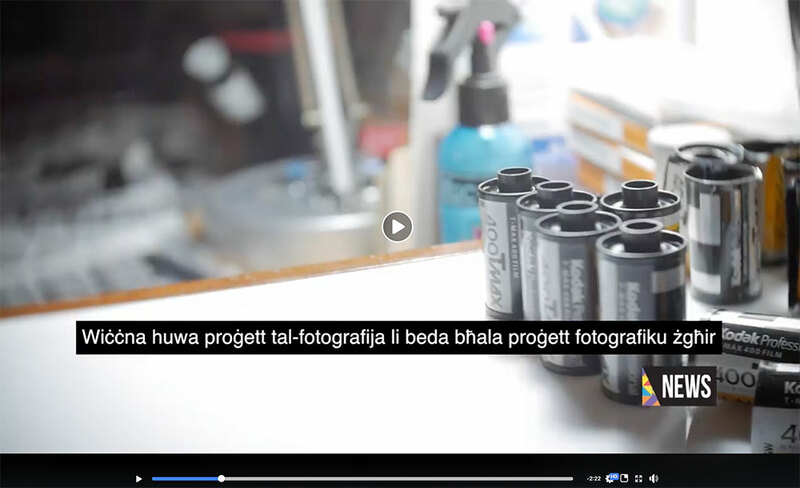 Another chance to support this labour of love, craftsmanship and creative patience by Yugo-Maltese photographer Zvezdan Reljic, in collaboration with Kotba Calleja and a number of Malta-connected writers. 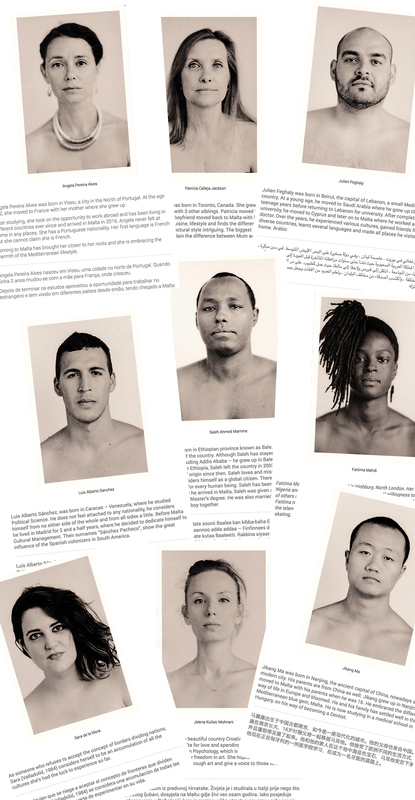 Wiċċna / Our Face will be a high-quality, portable book of two hundred lith-printed portraits, a dynamic and intimate snapshot of the diverse faces that inhabit and pass through an island. The book will be a culmination of long years of personal exchanges over Bosnian coffee, of shooting in the studio, of long hours of hand-printing in the darkroom, all of which has fine-tuned Reljic’s eye for capturing one’s personality and natural disposition from behind the lens. Designed in collaboration with Kotba Calleja, the book will include essays by Alexandra Pace, Philippe Parizot and Virginia Monteforte, prose by Walid Nabhan, and poetry by Leanne Ellul and Antoine Cassar. 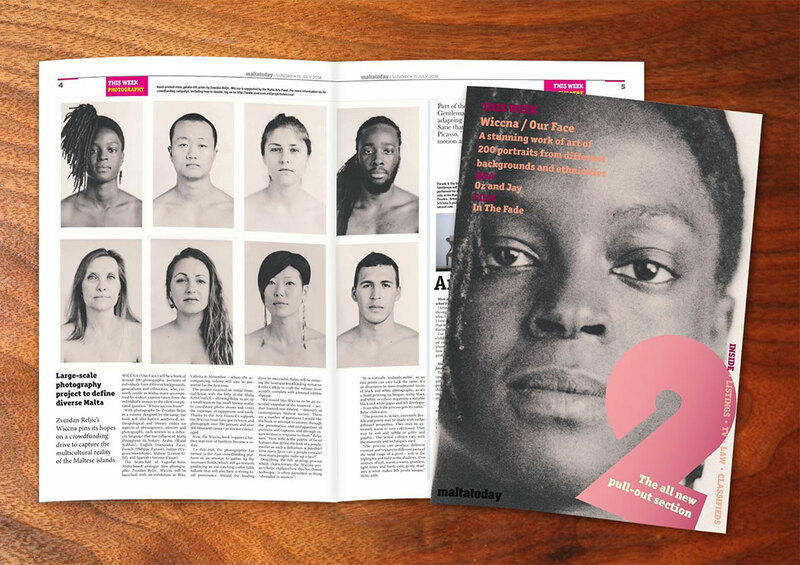 The photography phases of this project are supported by the Malta Arts Fund. This crowdfunding campaign is to cover the cost of book printing. Should we successfully reach our target, in order for us to be able to send you the Wiċċna book (or any other reward which includes the Wiċċna book), before transferring funds, please note that for shipping we will use flat rate below, based on current Maltapost parcel shipping costs, considering the estimated book weight plus packaging. - Malta: €7 or collection. By November 2018 we will send you an email indicating when the books are ready to be delivered, and how to proceed with the shipping cost payment. What is the aim of Wiccna project? 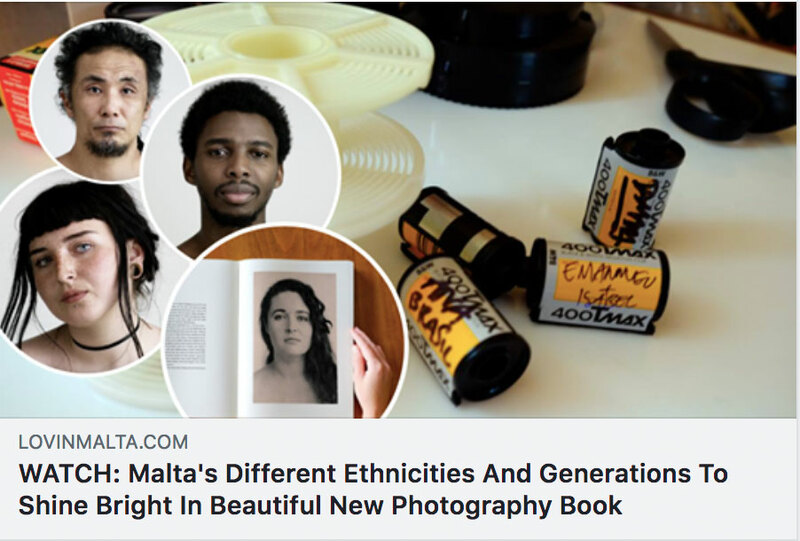 We would like Wiċċna / Our Face to be an extended snapshot of the nuanced – neither limited nor diluted – diversity of contemporary Maltese society. There are a number of questions we would like the book to attempt to answer, through the presentation and juxtaposition of portraits and captions, and through essays written in response to them. How wide is the palette of facial features that define the look of a people, insofar as such a definition is possible? How many faces can a people contain? How many peoples make up a face? A black-and-white film photography process, where prints were enlarged on silver gelatin paper using a special lith developer. When is the book launched? Where would the portraits be exhibited? At Blitz, 68 St Lucia Street, Valletta. For the production of the book. Where can I find more information about Wiccna project? On the Wiccna website www.wiccna.com and our Facebook page. If we successfully reach the target amount to print the book, you will receive the selected reward in November 2018. Your name mentioned in the Contributor List in the Wiċċna book. Two special 10 x 15 cm Wiċċna postcards, featuring at the back excerpts from the book by various authors. Ten special 10 x 15 cm Wiċċna postcards, featuring at the back excerpts from the book by various authors. An approximately 500-page book, size 16.5 x 24 cm, with the cover featuring a reproduced pattern from hand-painted paper art by Kotba Calleja. The Wiċċna book is now at the design stage, and while our crowdfunding campaign lasts, you have the opportunity to acquire this book at its production price. After the Wiċċna book is published it will carry distribution costs and it will cost €45. An approximately 500-page book, size 16.5 x 24 cm, with the cover featuring a reproduced pattern from hand-painted paper art by Kotba Calleja, plus 10 special 10x15cm Wiċċna postcards, featuring at the back excerpts from the book by various authors. The Wiċċna book, presented in a custom-designed and hand-crafted hardboard slipcase with hand-painted paper covers, mixed with the fine dust of Maltese stone. Hand-painted surface and stencilled art ensure that each box will be unique. 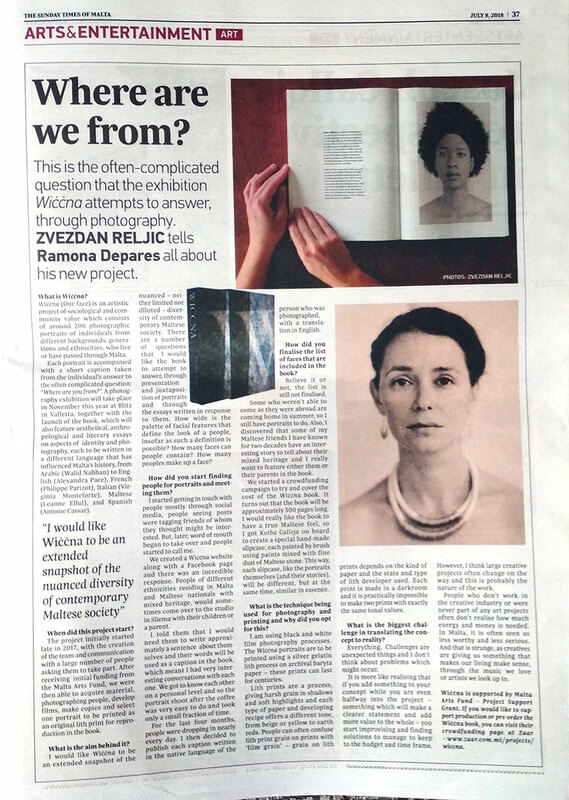 You will receive the Wiċċna book signed by Zvezdan Reljic, and a portrait session at your convenience. 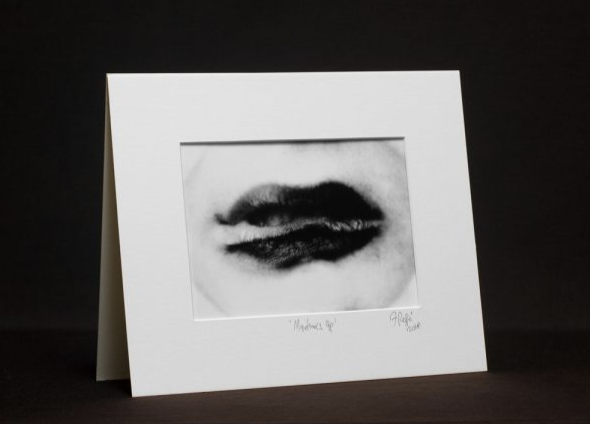 Zvezdan will print your portrait as an archival silver gelatin print on baryta paper for you to keep. Just send an email to prints@zvezdanreljic.com after your contribution, indicating your name and the title of the print you wish to receive from 'Wiċċna book reward 'A' page. Just send an email to prints@zvezdanreljic.com after your contribution, indicating your name and the title of the print you wish to receive from 'Wiċċna book reward 'B' page. Just send an email to prints@zvezdanreljic.com after your contribution, indicating your name and the title of the print you wish to receive from 'Wiċċna book reward 'C' page.